English professor Carrie Arcos admits that she was more in love with the idea of being a writer for many years before she actually became a writer. “Writers write, period,” said Arcos, emphasizing the discipline involved. Now, her hard work has paid off. This month, Arcos’ debut novel, Out of Reach, was chosen as a 2012 National Book Award Finalist in the young people’s literature category by the National Book Foundation — one of the nation’s most prestigious awards an author can receive. Only 20 authors were nominated for the four award categories. 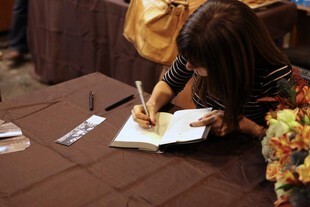 Released Oct. 16, the book launch at Skylight Books in Los Feliz, Calif. resulted in her book selling out in the store. Arcos said it was surreal to see her book on the shelves next to authors she admires. Next month, she will have the chance to meet a few of those authors at the National Book Award ceremony in New York. Arcos recently answered some questions about her new book and award nomination. 1. Out of Reach follows your protagonist, Rachel, in search of her brother, an addict. What inspired the premise for Out of Reach? Out of Reach was inspired by true events. I have family members who have struggled with addiction. I actually found myself looking for one at a point in my life. When I began Out of Reach, I knew Rachel, the main character, was struggling with pain and guilt and I thought her looking for her addict brother would be a good premise. The novel is a work of fiction, but since I have walked alongside a family member who has struggled with addiction for years, I feel it contains a great deal of emotional truth. I was also intent on not writing another book about addiction from the addict’s perspective because I feel there are plenty of wonderful books that do that. But I didn’t feel there were many from a sibling’s point of view, so that became interesting to me. 2. When did you find out you were a National Book Award finalist? I was actually at Biola! I had just finished an 8 a.m. Tuesday class when I checked my email. There was a message from the National Book Foundation for me to call them right away. At first I thought I was in trouble or something. When Harold Augenbraum, the executive director of the National Book Foundation, began congratulating me on being a finalist, I had to stop and ask him if he was serious. He laughed and assured me it wasn’t a joke. The idea that my book is included in such a prestigious list is something I would have never dreamed of. It’s kind of like the Oscars for American authors. I’m super excited to meet Gary Schmidt, one of the judges for my category. He’s one of my favorite authors at the moment because of his book Okay for Now. I’m also going to have a geek fan moment when I meet Louise Erdrich, a nominee for the adult fiction category. I absolutely love her work and have taught her book, Love Medicine, a couple of times. 3. You mentioned the discipline and hard work that it takes to write a book. What kept you going? Writing a book is a long process. I know people who can crank them out in a couple of months, but I’m much slower. I have three kids and work part-time teaching, so I don’t have tons of time. But I love the work of writing. It’s hard to create out of nothing, but it’s also incredibly rewarding when you’ve worked through a tough scene or have discovered a character’s motivation. And finishing a novel is awesome, even the first draft, which is almost always never very good. It’s a wonderful accomplishment. 4. How have you felt regarding the feedback Out of Reach has received? The feedback of getting selected as a National Book Award finalist before it even came out has been the best. Reviews are still coming in and are overall positive. Reviews are interesting and I’m trying to stay away from reading them, honestly. Not everyone is going to love the book, and I need to be ok with that. I don’t love everything I’ve ever read. To help me with perspective, I looked up one of, in my opinion, the best books in American literature, The Great Gatsby. It’s currently at a 3.7 out of 5 stars on Goodreads, a huge social media book site. What?! Clearly this is a ridiculous rating for Gatsby. 5. What advice would you offer to prospective authors who are interested in publishing or finishing a novel? The advice I have is if you want to write — write. It's a discipline, no way around that, and writers must finish. I talk to many people who say they want to write a novel, but they never finish. I also suggest finding a community of writers to be part of, since the act of writing is pretty solitary. Writing and publishing are two different things. If you want to publish, there are several different avenues one can take today. My advice would be to research and know what you want before you self-publish or start querying. 6. Writers such as William Faulkner, Robert Lowell, Flannery O’Connor and a slew of other prestigious authors have all won a National Book Award. What is it like to walk in their footsteps a bit? Oh wow. How do I even respond to that? I can't. I could try to think of something very prestigious to say, but I'll just come off as an impostor. I'm very aware of the honor that this nomination carries and I'm so so grateful. Carrie Arcos was born in Albany, New York, and still mourns the day her family left for the West Coast. She earned an M.A. in creative writing and English literature and writes young adult fiction. She loves teaching English—first high school and now college. Carrie currently lives in Los Angeles with her husband and three children. Out of Reach is her debut novel and has been selected as a 2012 National Book Award finalist for young people’s literature. Read more about Carrie Arcos at carriearcos.com. Out of Reach is published by Simon Pulse, an imprint of Simon and Schuster. Arcos is an adjunct professor at Biola University and teaches first year writing classes. Written by Jenna Bartlo, Media Relations Coordinator. For more information, contact Jenna at 562.777.4061 or jenna.l.bartlo@biola.edu. Congratulations, Carrie. What a wonderful honor.